News | WUDN – tagged "Summer"
It's me, Chloe. We have a special WUDN announcement coming next week. Can't tell. You'll have to stay tuned. In the meantime, you probably know we're pretty patriotic around here. I am sure you have seen all our American Flag swag from flasks to phone cases. We think America and most of her President's are worth celebrating. (we're looking at James Buchanan). And, although Summer is still weeks away, the sun is too bright. I know, please don't remind me it's reflecting off the snow. So, we hate squinting, and we love Presidents Day, therefore we put our one and only favorite pair of wooden sunglasses on-sale just for you. The features kill, but more important, you'll look great. Serious old-school "Risky Business" style. I hope you're old enough to get that reference. If not, you can watch the whole thing on YouTube for $2.99. Go ahead, we'll wait. And they're on-sale for 15% OFF through Monday Night. High-quality, UV-400 Polarized, Polycarbonate Lenses with Anti-Glare Coating & Scratch Resistance. Stainless-Steel Spring Hinges for Durability & Comfort. Real Ebony Wood Temples. The Wood Grain is Visible, and Every Pair will be Unique. Wrapped in a Micro-Fiber Cleaning Bag and Delivered in a Solid Bamboo Cylinder. And we couldn't agree more. The variety of beer is stuff I have not seen at the grocery store, and probably couldn't find in our smallish city. For a price this reasonable, I get some great beer, delivered to the door. I have this one snooty neighbor, and he is always impressed. 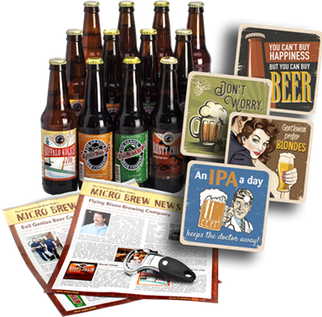 Pair your new monthly craft beer deliveries with some new wooden bar accessories. P.S. No money changed hands in the making of this blog post and we do not receive a commission on Craft Beer Club sales. We genuinely love their products.